We Specialize in Trenchless Technology Underground Sewer Service Line Repair and Replacements, for Commercial and Residential customers in Alexandria Va. Welcome to Interstate Enterprises Plumbing Service, your local contractor specializing in Commercial and residential sewer line / sewer main repair and replacement throughout Alexandria Va.
What should you do if you perceive a possible problem? Contact a sewer/water line specialist ASAP. Ignoring a potential sewer or water break may result in extensive and expensive damage to your yard, landscaping, driveway and home or business. 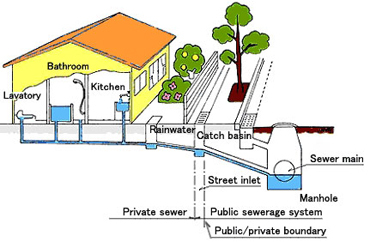 Raw sewage exposure can result in harmful bacteria and mold growth. Be sure to ask about our new "trenchless technology" which allows us to fix or replace sewer lines without destroying landscaping! Interstate Enterprises, Inc. uses method of sewer line installation whenever possible and often saves our customers the time, energy and money required to fix their landscape following a sewer line leak or failure. When a backed up sewer line occurs, a rapid response can prevent thousands of dollars worth of damage to your yard, landscaping, driveway and home. Interstate specializes in sewer and water line repair and is both licensed and insured. We specialize in quickly and efficiently repairing and/or replacing underground sewer and water lines. Our professionals will quickly and efficiently identify your sewer blockage’s (or break’s) location, then repair the line with state-of-the art technology. Interstate Enterprises Plumbing Service – look to us for quick, quality sewer line replacement or repair! Contact Interstate Enterprises, Inc.’s 24 Hour Emergency Line at 703-250-8830 or 301-469-7859.